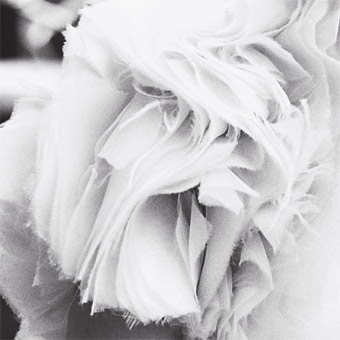 Tomorrow we'll be doing some heavier reflecting on the New Years Bride--past and present. But today I wanted to wish luck to those of you saying 'Ido' either tonight or tomorrow. If you're still up-in- the-air about accessorizing your look, here are a few great ideas . . .
With the exception of my six-pound Chihuahua, this has to be the best Christmas gift I ever got and believe me it was read front to cover in one sitting. 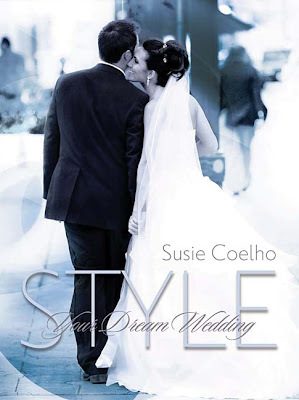 Lifestyle expert Susie Coleho has reached the pinnacle of wedding style with her book, Style Your Dream Wedding. From the high quality paper and polished layout of this lovely coffee table book to first look inside, it's one visual surprise after another, thanks to some stellar photography. Susie guides us through the planning of your big day beginning with finding your a color palette and wedding style. She describes seven different style weddings: classic, beach, contemporary, country, garden (her favorite and mine), fanciful (your own spin) and exotic. A bonus to this book is not only a pull out booklet offering a color palette for each wedding style, there's a quiz booklet, dress silhouette accordion pullout, six 8-page gatefolds full of photos, a CD of traditional wedding music, postcards, and, of course all that stunning photography. I would have liked a lengthier section on fashion of course and more descriptions and detail about fabrics, silhouette, style, head chic and so on. 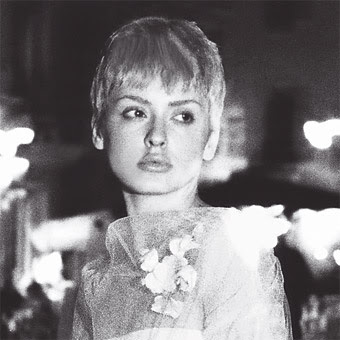 However, the strong photography carries this book where words aren't necessary, leaving the bride open to getting in touch with her own muse. 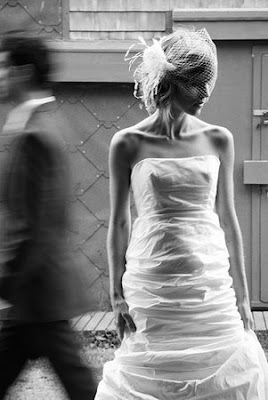 Using mostly real life brides and their weddings as examples in the photos, conveys reality at its finest. As you read along you'll realize, yes, with some coordination all this is possible. 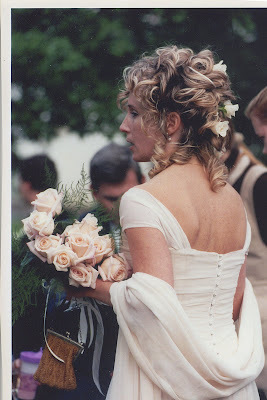 For me Style Your Dream Wedding will be a great reference tool and inspiration source for tons of upcoming posts. For you, it's a real gift for planning and realizing the most beautiful and unique wedding is indeed in the waiting. . . . Lately some hats and headpieces have become an art form worthy of a place in a fashion museum. Alice Hart Couture Millinery of Vancouver, B.C. is right up there specializing in hats and some magnificent fascinators and cages. Her head wear caught my attention for the pure playfulness as well as originality. 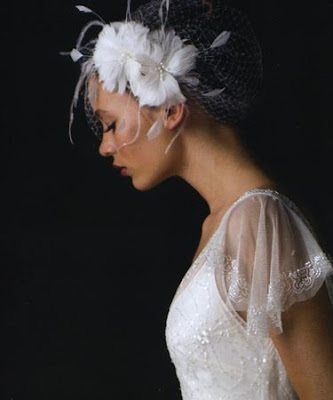 Above the shoulder veils and headpieces like these are great for showing your gown to its best advantage. Want to see more of Alice's work? Check out her site http://www.alicehart.com/. Also if you're more of a hat bride--oh la la! Definitely worth looking at the craftsmanship on her wide-brims and cocktail hats with feather varied treatments. 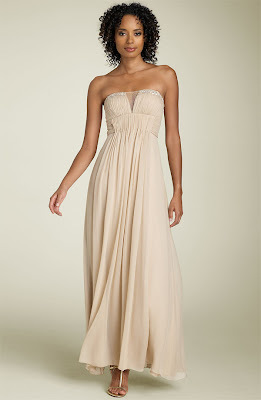 If going clean and fluid is in your plans look for those simple flowing dresses in silk satin and chiffon with a few beaded details, maybe some ornamentation at the neck, waist or hemline. 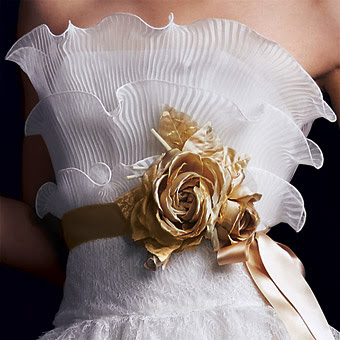 This is a bolero jacket by by Monique Lhuillier in satin organza with vertical ruffles. 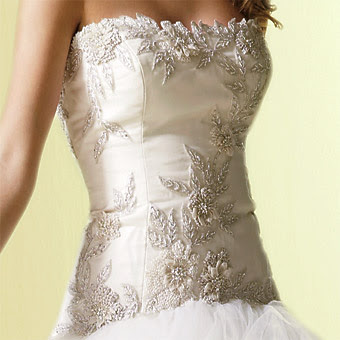 Did you know the bodice is the focal point of your gown and reflects its overall style? Whichever kind you choose will determine whether or not your gown has sleeves, a collar, high or low neckline, lace overlays, etc. Proper fit from waist to neckline is essential and the place the most precise measurements need to be taken. 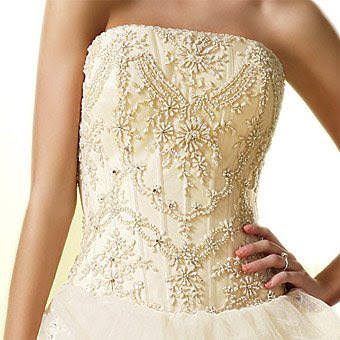 Because a bodice is either darted or seamed, it typically has the most shaped and sculpted seams of any other piece on your gown. Also it's the center most piece that other components are attached and take form—the place your gown finally goes from flat to a three dimensional piece of fabric sculpture. If you’re eco-conscious about the fabric you want to incorporate into your wedding gown, are you ever in for a treat this season. Some of the green finds for 2009 are truly remarkable and I can’t wait to introduce these new gems to my clients, not only for their look good factor but also for sustainability. So what makes for an eco-friendly fabric? Believe it or not Eco-friendly is now including polyester on its list. That’s right. If you can find a way to recycle a dress (or anything) from something polyester, you’re helping make the world a greener more livable place. Actually, this ‘re-sourcing’ of fabric can apply to any fabric that gets recycled like the 100% Swiss cotton Summer dress above. 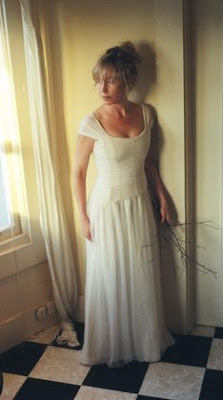 Hemp and silk always top the list for luxury like the gown pictured above and below in hemp and tea-dyed silk gauze. 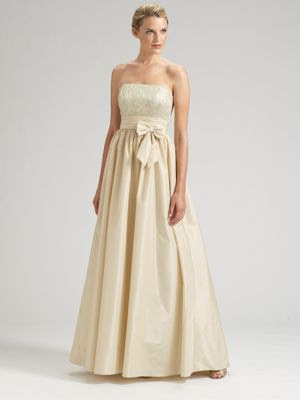 Since some weddings are going a little more casual lately, we’ve also seen some gorgeous cotton, linen and bamboo dresses. Here's a close up look at some of those fabrics making the Green Designer A-List (Okay, okay, okay: Amy's personal favorites Green A-List). HEMP SILK and Hemp Charmeuse. 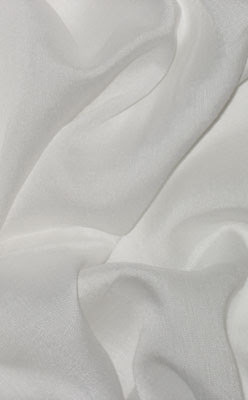 (above) Here’s a fabric getting some rave reviews these days, combo hemp and silk. 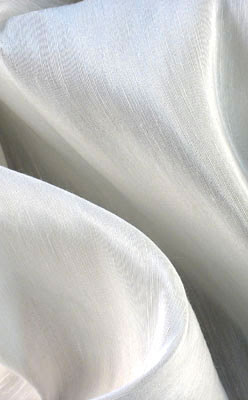 The silk has a luxe sheen while the hemp provides strength and body. Like silk charmeuse, Hemp Charmeuse has a shiny side and a matte side. Both sides highlight that slubbiness hemp has. This is really going to be a popular fabric for bridal wear in the next few years. BAMBOO-(above) Some Bamboo drapes and acts like silk but has a stronger make-up. Bamboo also has a property called, Bamboo Kun, a micro-bacterial. Because of its nature, bamboo can be washed, go through fifty washes and still hold onto all its anti-fungal properties. I’ve also heard it prevents body odor . . . . well, all I can add to that is, we’ll see. ORGANIC COTTON-(above) Here's a question I get all the time. What’s the difference between organic and regular cotton? First answer: it has been grown free of chemicals and pesticides. Second: If whitened, it’s done so via a peroxiding process (approved method of G.O.T.S.—Global Organic Textile Standards) not bleach. One of my own contributions to going green is replacing some of the collection samples with crinoline petticoats in 100% organdy (stiff cotton). 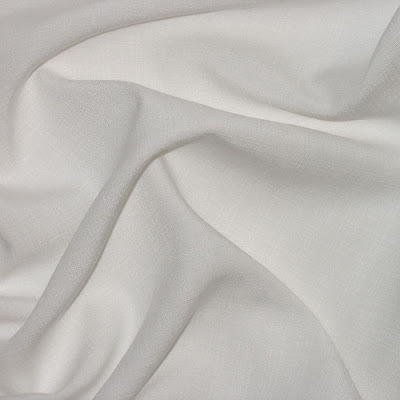 COTTON OR RAYON VOILE- Ahhhh! Any chance to show the famous Letty Lynton dress (right and below) from the comparatively obscure 1932 classic film! When I first laid eyes on this design by Hollywood costumer, Adrian, I never forgot it. And how could I? 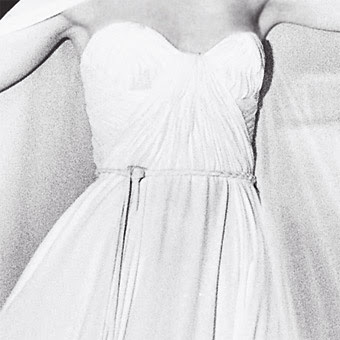 Made of light weight cotton voile, this gown sold copies in record numbers back in the depression when Macy’s—in a special arrangement with MGM was able to offer it to the public. 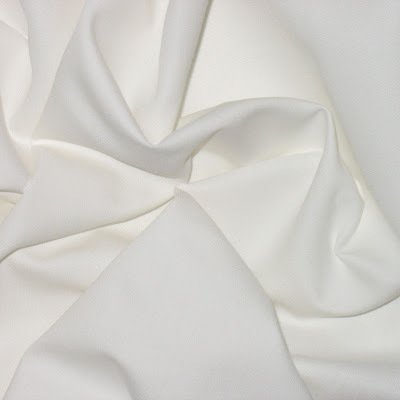 Both Rayon and organic cotton voiles are making comebacks this season in daytime formals, maybe not as exaggerated as this one but light weight and flowing. A last word about silks. 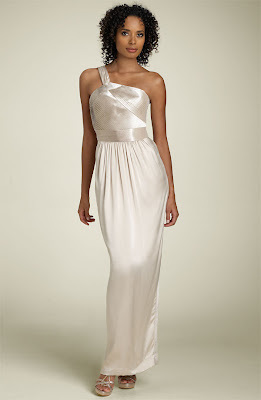 With all the new fabrics out from soy to bamboo, when it comes to bridal wear, silks still rule whether organic or not. If you’ve been wondering why everything is going down in price while wedding gowns keep those high price tags here’s a bit of info from Dharma Trading that might help. Not to long ago China revalued their currency; once they did, the price of silk yarn went up so naturally shipments to our manufacturers and designers cost more. Once silk prices go down (if they do) hopefully the cost of a wedding gown will come down as well. Till then, be prepared to pay more on most fabric imported from China which would include hemp, bamboos and silk. Here it is Christmas Eve day already. If you're lucky enough to have a free block of time and want to do something festive why not check out a performance of The Nutcraker? Searching for this lovely photo, I found just about every city, college, community theatre, ballet school and company on the planet has a production. It's become as much a Christmas tradition worldwide as eggnog and Santa Claus. This scene above is from the Boulder Ballet's version; the corps de ballet always reminds me ballet is one place all those tulle ballgowns we associate with bridal originated. Got tagged! Thank you Prima Donna Bride for the Fabulous Blog Award. An honor. Here are the rules: List 5 obsessions/addictions that you have, and tag back to the person who gave you the award. Post the rules. Tag 5 more people! 1) Greedily collecting pieces of clothing I may never wear and finding storage in my garage to accommodate bags and bags. 2) Coffee. Anytime, anywhere . . . 3.) Can't function till house and shop space are immaculate. 5) Writing fiction when I should be making patterns. Here's who gets this Fabulous Blog Award now! 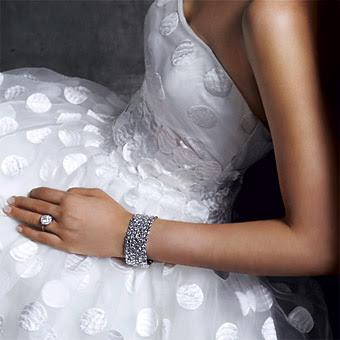 So many brides are searching for that designer gown at a reasonable price. Face it though, top designer gowns are still dangling high price tags despite this house of cards economy we're stuck with. I did happen to spot some great gowns the past couple months I had to share with you because the price is just too right to pass up. If the names Badgeley Mischka and J. Crew ordinarily spell out $2000.00 and up prices, check these out . . .